Read our first Press Release here! iGEM Fellow, Kim de Mora, is guest blogging on the Addgene blog. "Synthetic Biology & the Importance of Assembly Standards"
Join us at the Giant Jamboree! 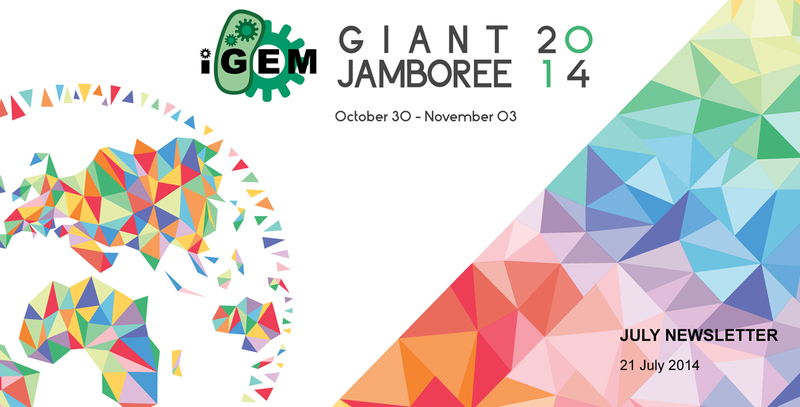 With no regionals, and the largest number of teams yet taking part in iGEM, the Giant Jamboree is sure to be the largest gathering of synthetic biologists to date. In addition to team presentations and posters, we will host several kinds of special events such as workshops, panels, and get-togethers. Have an idea? Let us know! The Giant Jamboree is fast approaching and these next 3.5 months will go by fast as iGEMers work to finish their projects, finalize wikis before the freeze and get those last few results before coming to Boston. To help you prepare for the competition, we’ve updated the Judging page, so check it out for more in-depth info on judging this year. Also, check out the iGEM calendar of events so you don’t miss any deadlines! We would like to introduce our Director of Judging, Peter Carr. He is a longtime iGEM participant, advisor and former head judge. As Director of Judging, Dr. Carr will be responsible for overseeing the judging process this year and will bring his wisdom gained through many years of participating in iGEM to judging in 2014. Help us welcome our co-head judges in 2014, Beth Beason-Abmayr and Janie Brennan. Beth has been our co-head judge since 2012 and Janie has been head judge at the High School Jamboree for the last two years. We are excited to have such a great judging team leading this year’s judging activity, particularly with the monumental task of judging at the Giant Jamboree. This year we are introducing the iGEM Responsible Conduct Committee. The role of this committee is to ensure responsible conduct on the part of all iGEM participants and to address issues of inappropriate behavior in iGEM. The committee is lead by Director of Judging, Peter Carr. The committee is tasked with upholding the values of iGEM including integrity, good sportsmanship, respect, honesty, celebration, cooperation, effort, and excellence. To read more, visit the Responsible Conduct Committee page. ( http://2014.igem.org/Judging ) for more details!